Researchers around the world can now capture the moment when a liquid drop, smaller than a pinhole, reacts on a solid surface, thanks to research and technology transfer efforts of a team led by Dr. Xiao-Ying Yu, a chemical imaging and atmospheric chemistry scientist at Pacific Northwest National Laboratory. 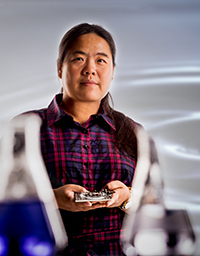 Yu and her team developed PNNL's System for Analysis at the Liquid Vacuum Interface, or SALVI, allowing—for the first time—powerful imaging instruments such as scanning electron microscopes to study liquid samples reacting in real-time and a realistic environment. The team was presented a prestigious Excellence in Technology Transfer Award in 2015 from the Federal Laboratory Consortium for Technology Transfer (FLC). The award recognizes outstanding work in transferring U.S. government-sponsored technologies to the public and private sector. SALVI, small enough to fit in the palm of a hand, works with many scientific instruments including time-of-flight secondary ion mass spectrometers and scanning electron microscopes. It requires as little as two drops of a liquid for the instrument to analyze the sample, and does not require special sample preparation that can alter or destroy the sample's integrity. With SALVI, scientists can discover new molecular insights in liquid-to-solid and liquid-to-liquid interfaces, for biological, chemical, and atmospheric applications. PNNL worked with Pennsylvania-based Structure Probe Inc. (SPI) to license the associated patents and adapt the design to bring the technology to the broader scientific community. PNNL commercialization manager Bruce Harrer identified the commercial value of the technology and advised the team throughout the technology transfer process. Other team members included Drs. Zihua Zhu, a scientist at EMSL, and Li Yang, former PNNL research postdoc, assisting Yu with the scientific and technology transfer efforts. Gene Rodek of SPI was instrumental to help transition the technology from a prototype scientific instrument to a commercial product. SPI began taking customer orders for the commercial version of SALVI (known as Wet Cell II) in August 2014 and expects commercial products to ship in 2015. EMSL is a U.S. Department of Energy (DOE) national scientific user facility at PNNL. For more, see PNNL news release, "PNNL recognized for moving biofuel, chemical analysis innovations to market."